Met Music Director Emeritus James Levine brings out all the sparkle and charm in Rossini’s comic—and very touching—score. Marianna Pizzolato is Isabella, the feisty Italian girl who finds herself in Algiers thanks to a band of kidnapping pirates. Though she’s destined for the harem of the ruling Bey, Mustafà (Ildar Abdrazakov), Isabella’s quick wits and feminine charms enable her to rescue her long lost lover Lindoro (René Barbera) and reconcile Mustafà and his longsuffering wife Elvira (Ying Fang). 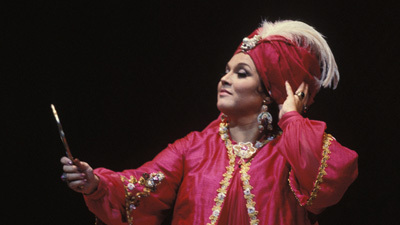 With Nicola Alaimo as Isabella’s companion Taddeo and Dwayne Croft as Mustafà’s servant Haly.